We invite you to explore the unique Navajo Nation Tribal Parks of Antelope Canyon and surrounding area that offer countless scenic wonders. This workshop provides a great opportunity to develop your personal style, enhance your creativity, refine your photographic vision and improve your technical proficiency as we explore the enchantment of Upper and Lower Antelope Canyon, famous Horseshoe Bend overlook, beautiful Lake Powell and many other amazing overlooks and canyons. Upper Antelope has a condensed beauty and one of the unique areas of interest is the light beans that pierce from cracks on the ceiling shining down into the depths of the deep canyon walls. We will spend two full hours in the canyon plus travel time to get there. Lower Antelope Canyon is much longer and requires metal ladders for a decent into the less traveled canyon with four full hours of time to explore. Day 1 - Sunday: Meet in Page, Arizona at 4 p.m. for orientation and our first lecture. Day 2 - Monday: We will start our day with a sunrise shoot over Lake Powell. We will return to Page for breakfast and a break. 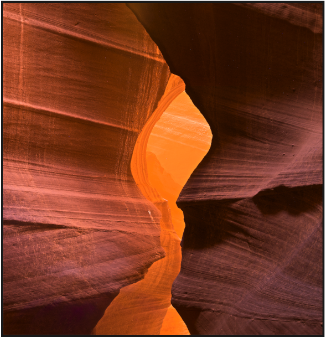 We will start our Photo Tour of Upper Antelope Canyon at 10:00 a.m. to 1:00 p.m. We will visit Water Holes Slot Canyon for our afternoon shoot. Day 3 - Tuesday: We will be up early for a sunrise shoot of famous Horseshoe Bend. We will return to Page for breakfast and a break. We will begin our four hour shoot of Lower Antelope Canyon at 11:00 a.m. to 3:00 p.m. On our afternoon shoot, we will visit Glen Canyon Dam and the Lake Powell overlook of Wahweap Marina. Day 4 - Wednesday: We will leave after breakfast for Navajo Bridge, Marble Canyon and an uncrowded 2.5 mile round-trip hike inside Cathedral Wash to discover an unusual variety of shapes and multilevel benches and ledges. We will break for lunch and then have a photo review of participants photographs. Our afternoon shoot will take us back to Lake Powell for commanding views from Alstrom Point. Our workshops emphasize field work, however we feature a balance of field work, a classroom-based session, critical review of your work as well as ample time to answer your questions. This workshop features 2 hours of classroom instruction and 2 hours reviewing workshop participant's images. Day 4: 2:00-4:00 p.m. Review - what makes a great photograph? During this session we review and comment on your work. Please bring 3 prints of your 'best' work for evaluation, critical review and sharing with the group. The weather in Page, Arizona in late September can be mild and beautiful. Daytime temperatures average 80F and nights average of 55F. with a slight chance of rain. Elevation around Page is about 4,000 feet. The key is to be prepared for a wide range of weather conditions and temperatures, bring layers and an outer layer suitable for rain. Hiking boots are the best choice for footwear. Bring plenty of water and snacks during our location shooting. Consult our gear checklist to learn what we recommend that you bring. Workshop participants are responsible for their own lodging, meals and transportation. The town of Page features many lodging choices that can be found at the website Welcome to Page Arizona and Lake Powell. We will often eat meals together, however you are free to join us or eat independently. A vehicle with high ground clearance and 4WD is desirable and recommended but not necessary for this workshop. Car pooling is recommended during our outings and is a great way to get to know your fellow workshop participants, share your passion for photography and learn new points of view. Workshop participants are responsible for any fees for parking, park entrance and park usage.